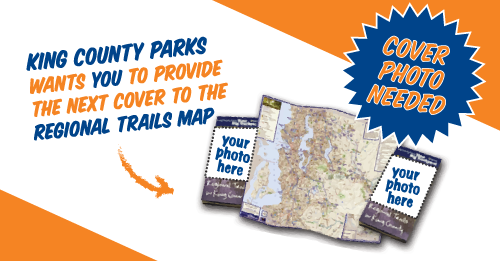 The First Ever Regional Trails System Map Cover Photo Contest! 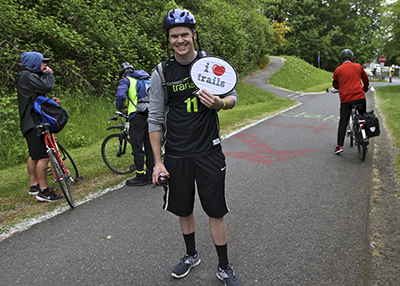 Share your best photo of the recreation activities you enjoy on the regional trails system (RTS) in King County, and it could wind up as the cover on the official RTS map. We know you’re doing fun things out there on the RTS, so show us what you got! In addition to winning the cover photo feature on the RTS map, don’t let us forget to mention that there will be prizes, too. Read on for all the details, and then get out there and recreate! Judges’ Choice Grand Prize: One winning photo will be featured on the cover of the next issue of the “Regional Trails in King County” map, which is available online and in print when it is reprinted this September, and will remain on the cover for at least the next six months. In addition to the cover photo, winner will also receive a performance REI XT 85 pack generously donated by REI. Second Prize: The runner-up will win a pair of tickets to a 2014 Marymoor Park Concert Series show. Honorable Mention: Receive a King County Parks swag bag. King County Parks employees, their family members, and contest judges are ineligible. See contest rules for more information about eligibility. To submit your photos, use your Yahoo!, Google or Facebook account to log into Flickr. If you do not have an account, you can sign-up for free. Upload your image to this group. Identify the location of photo in the photo caption. For example: “Name of trail, exact location” – Burke-Gilman Trail – near Log Boom Park (geo-location preferred). Image content must not demonstrate any inappropriate or illegal activity, such as off-leash dogs, or cyclists or equestrians without helmets. The photo must be able to fit the vertical format of the map’s cover – wide landscape orientation shots are discouraged. The minimum resolution should be 300 dpi. Photos should be from within the past 12 months. Please submit your own photos. The winning image will be evaluated by a panel of King County employees. King County Parks employees will select 10 photos for final judging by the panel. The winning image will be evaluated based on overall impact, artistic merit, and technical excellence. If any persons or private property appear in the photograph, the Participant is responsible for obtaining, prior to submission of the photograph, any and all releases and consents necessary to permit the exhibition and use of the photograph in the manner set forth in these Contest rules without additional compensation. If any person appearing in any photograph is under the age of majority in their state/province/territory of residence the signature of a parent or legal guardian is required on each release. Winners will be notified via FlickrMail to their Flickr account profile on or around August 18, 2014 and will be given seven days to respond after date of notification. King County Parks is not responsible for lost/damaged prizes. Full contest details and rules can be found on here. Previous Post This is what progress looks like at Redmond Ridge Park!